It is commonplace in modern commercial life for parties to sign and exchange documents by email, rather than coming together for a physical signing ceremony. Even though this is now a standard practice, there has been little consensus in the past on what needs to be done to ensure that documents that are signed in this way will have their intended legal effect. The December 2015 issue of this Journal published a set of protocols that had been developed by practitioners from five leading firms, as a set of standard practices that should allow remotely-executed documents to have their intended effect. This article considers the legal principles that underpin the operation of those protocols. Insider trading has a reputation as a complex and contentious offence, combining some of the more difficult aspects of both corporate and criminal law. In essence, insider trading is the act of trading in financial products (such as shares or other securities) while in possession of relevant non-public, price-sensitive information. A key element of the offence of insider trading is that the offender has possession of certain inside information. Cases which have interpreted the elements of insider trading have indicated that the “possession” of inside information necessarily imposes an “element of awareness” of the information, but the ordinary concept of possession under the criminal law will usually require a person to also have physical custody or control of the relevant item. This is a requirement with little practical relevance or application to insider trading. In order that the nature of the forbidden conduct is clearer, and for greater certainty and consistency under the law, the author proposes in this article that insider trading laws be reformed so that the “possession” element of the insider trading offence is replaced with a new requirement of “awareness”. The consumer movement in the 1960s was the first step towards creating community demand for laws to protect consumers. Australia responded with consumer protection laws in the 1970s, and with unfair contract laws in the 1980s at the State level, since replaced by Commonwealth provisions in the Australian Consumer Law and the cognate Australian Securities and Investments Commission Act. The European Union (EU) drafted and adopted in 1993 the Unfair Terms in Consumer Contracts Directive to provide protection from unfair contract terms. The Directive has now resulted in consumer contract laws in Europe ranging from prohibition in some EU jurisdictions to the low impact approach of rendering unfair terms void or non-existent in some other EU jurisdictions. The latest European legislation is now to be found in the new unfair contract amendments in the United Kingdom in the Consumer Rights Act 2015 (UK), which has replaced earlier UK legislation from the 1970s. In proscribing unfair contract terms, the UK Act carries forward and updates the current fairness test, and includes a “grey list” of consumer contract terms “which may be regarded as unfair”. 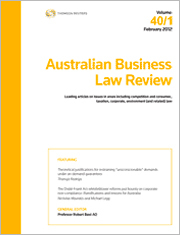 This article reviews the operation of laws dealing with unfair contract terms from an Australian comparative perspective. It includes developments in the UK with some parallel developments from the EU and the Asia-Pacific area to demonstrate law making in response to consumer demands in different jurisdictions and to show that cultural difficulties can be overcome to ensure an adequate response to unfair contract terms for the benefit of consumers. For the PDF version of the table of contents, click here: Westlaw AU – ABLR Vol 44 No 4 Contents or here: Checkpoint – ABLR Vol 44 No 4 Contents.